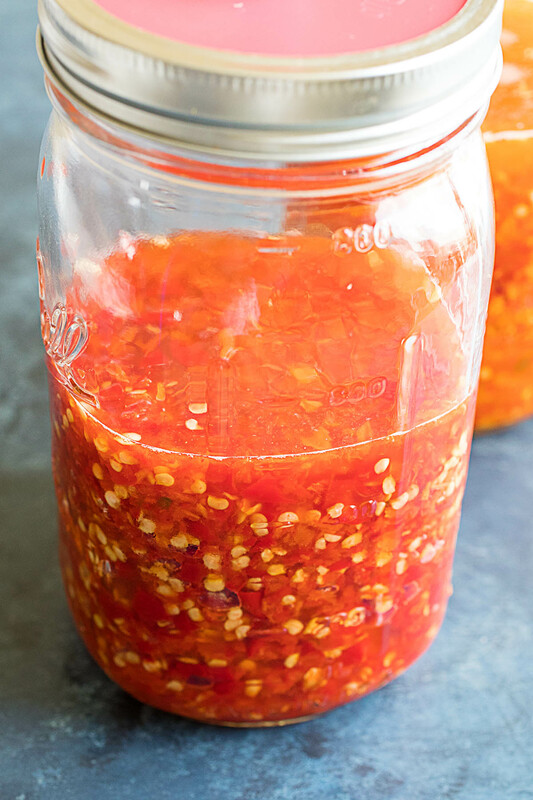 Learn how to make fermented pepper mash at home so you can make your own homemade hot sauces and help preserve your abundant chili pepper harvest. Fermenting chili peppers is a fun, great way to preserve them, and essential for making hot sauces. There are many ways to make hot sauce, and as you can tell by our Hot Sauce Recipes section of the web site, I’ve made a lot of them. However, one way we have yet to explore is making them with fermented chili peppers. If you’ve ever enjoyed Tabasco sauce, you’ve tasted fermented chili peppers. Tabasco starts with tabasco peppers which they crush, mix with salt, and ferment in oak barrels for up to 3 years. The original Tabasco sauce only uses 3 ingredients – tabasco peppers, salt, and distilled vinegar. A number of hot sauce makers use fermented peppers in the form of pepper mash to make their products, and a good pepper mash makes a difference in the resulting flavors. If you’re interested in making sauces from pepper mash, good news. It’s easy to make at home and you don’t need to wait 3 years for it to be ready. 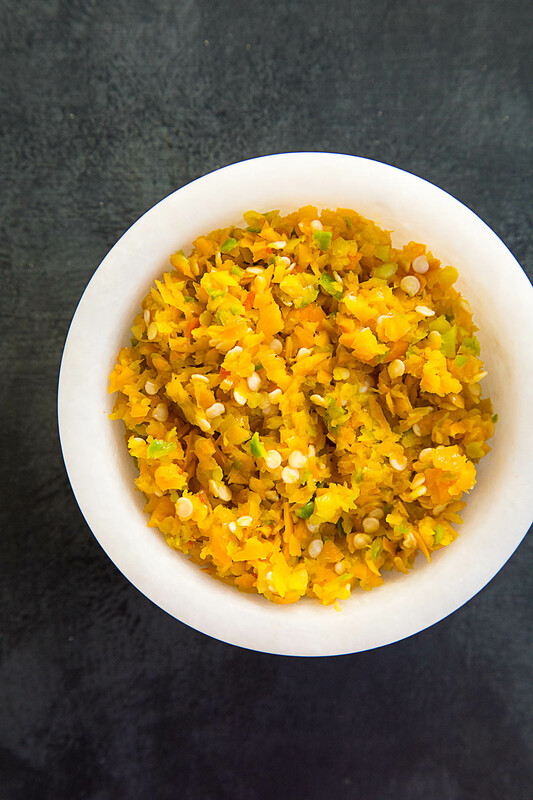 What is Fermented Pepper Mash? Pepper mash is a collection of chili peppers that have been mashed together with salt then aged until they break down chemically. Fermentation is one our oldest methods of food preservation. Humans have preserved many foods this way, from cheeses to wine to a slew of other vegetables. Fermentation, basically, is the decomposition of foods by micro-organisms (Lactic Acid Bacteria) or enzymes. We create an anaerobic (no oxygen) environment for the peppers so the natural Lactic Acid Bacteria can thrive, and other undesirable bacteria cannot. Bad bacteria, such as rotting molds, cannot survive in an anaerobic environment, which we create with salt and brine, therefore protecting the peppers while the good bacteria do their work. The salt is not actually the preservative. It is the acid produced by the fermentation process that does the preserving. Lactic acid bacteria consumes carbohydrates in the peppers and converts them to acid. After fermenting, the carbohydrates have been predigested, leaving them with more vitamins and flavor than fresh peppers. It is akin to a controlled decay process, and there are numerous benefits to fermentation, including more digestible foods and more desirable flavors. With peppers, you’ll notice a mellowing of flavors, changes in color, and in the pleasant smell of the resulting mash. How Safe is Fermenting Peppers? Very safe! Before I began my exploration into fermentation, I succumbed to the common misconception that fermenting could easily lead to rotten or even dangerous foods, but in truth, fermentation is very simple and hard to mess up. The key is to ferment properly. You’ll know if you’ve made a mistake by the smell of a ferment. It will smell “off” or “rotten”. The fact is, we’re fermenting in a controlled environment, so just be sure to follow the proper procedures. 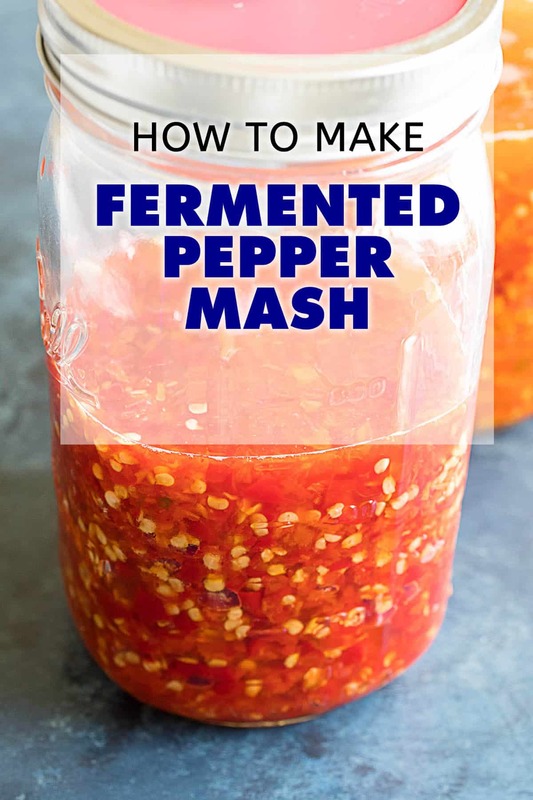 You can make fermented pepper mash from any type of chili pepper, even dried peppers. Your only consideration is the thickness of the pepper walls. Thicker walled peppers may need to be strained after the fermentation period, to remove the coarser skin, so you don’t need to seed them if you don’t want to. Thinner walled peppers won’t need straining, so you may want to seed them first if you prefer a smoother result when you process the mash later on. To make pepper mash, first process your fresh peppers in a food processor. If you don’t have a processor, use a mortar and pestle or simply finely chop them. Next, mix in salt. You should use 1 teaspoon salt per pound of peppers. 1 pound of peppers should process down to about 1 cup of mash. So, use 1 teaspoon of salt per cup of mash, which is roughly 2.3% salt by weight. The peppers will begin to release their moisture right away. A note about salt: most salts are fine to use, but avoid using salts with additives, such as table salt. Place your mash into a jar and press it down to remove any air pockets. Leave at least 1 inch of headspace. The peppers may rise a bit when fermenting. The brine will rise up and cover the peppers. It is important to keep the peppers covered with brine to avoid spoilage. Check this daily. Screw on the lid and set the jar away from direct sunlight to ferment for at least 1 week. Ideal temperatures are between 55-75 degrees F. The most active fermentation period is between 1-2 weeks, so be sure to monitor it during this time. “Burp” the jars often by unscrewing the lid a bit to let out some of the accumulating gases. Or, use an airlock or membrane for easier fermenting. See below for what I like to use. After 1-2 weeks, the fermenting activity will diminish. Move it to a pantry where you can let it ferment longer if you’d like, or use it right away.You can ferment for months or even longer to allow the flavors to more fully develop. Once it is ready, store it in the refrigerator where it will last for a year or longer. An alternate method to the basic pepper mash is using a brine, which is a salt water solution. The primary difference is that we’re adding water rather than using the natural juices from the peppers. This method ensures the peppers stay beneath the brine, and is more ideal for thinner walled peppers. To make a brine pepper mash, first process your fresh peppers in a food processor. If you don’t have a processor, use a mortar and pestle or simply finely chop them. Pack them into a jar, leaving at least 1 inch of head space. The peppers may rise a bit when fermenting. Next, mix 1 quart unchlorinated water with 3 tablespoons sea salt. Pour just enough brine over the peppers to cover them, pressing them down a bit as you go. It is important to keep the peppers covered with brine to avoid spoilage. Check this daily. After 1-2 weeks, the fermenting activity will diminish and the brine will turn cloudy and taste acidic. Move it to a pantry where you can let it ferment longer if you’d like, or use it right away. You can ferment for months or even longer to allow the flavors to more fully develop. Once it is ready, process it with a food processor. You can use it right away to make hot sauce or store it in the refrigerator where it will last for a year or longer. I personally like to add a bit of vinegar at this stage before storage. Aside from jars and your ingredients, I like to use Masontops lids, which include pickling weights and a membrane allowing gases to escape without the need for burping. You can use them with any wide mouth mason jar. Here is a link to where you can buy them on Amazon. It’s an affiliate link, my friends. FYI! I also highly recommend this outstanding book by fermenting experts, Kirsten K. Shockey and Christopher Shockey – “Fiery Ferments: 70 Stimulating Recipes for Hot Sauces, Spicy Chutneys, Kimchis with Kick and Other Blazing Fermented Condiments”. I learned a lot from this book as well as through my own experimentation. Grab a copy today. Good luck, and happy fermenting! Let me know what you make with your pepper mash. Why Does My Pepper Mash Taste Bitter? I sometimes get some bitterness with my fermented pepper batches. I’ve seen a lot of discussion on it, whether it is from kahm yeast or from the starting peppers themselves, where the slight bitterness is amplified in the fermentation process. The best way to counter it is through the addition of other ingredients. Also, some people report a bitterness from the pepper seeds, so try removing the seeds before fermentation and see if that affects your resulting flavor. To counterbalance the bitterness, try adding an acid like vinegar or lime juice, which can help balance it out, then a sweetener like sugar or honey. Certain roasted vegetables can help, too, like carrots or other flavors. Garlic is good. They can all help balance out the bitterness. Give the final sauce time to rest and let the flavors meld in the refrigerator. Kahm yeast is a whitish film that can sometimes appear on top of your ferment. It can form when all of the sugar in your ferment is consumed. The PH drops because of lactic acid buildup, allowing kahm yeast to form. It is not a mold, and can be scraped away from your ferment. Sweeter vegetables, particular peppers, are more prone to kahm yeast. Here are some of my own recipes that use fermented chili peppers. Check out more Hot Sauce Recipes or learn more about How to Make Hot Sauce. Hi. Did the salt water fermentation process. After about 2 weeks, got white mold layer. Is that right? Rob, is it mold for sure? It might be kahm yeast. Kahm yeast forms when the sugar is consumed and the PH drops because of lactic acid formation. Peppers are more prone to this because they are sweeter. Kahm yeast can be scraped off. Let me know. Hi. Not sure if this has been asked.. I made my mash…did the fermentation…got some great sauce. Now I have left over mash, which I thought would make a great relish. Any advise or recipe on how to make a relish from my unused mash? Rex, yes, you can use it to make a relish. Follow my Hot Pepper Relish Recipe using the mash. I think it would be great! Hi , have tons of serrano peppers , can i do The fermenting proces in 200 liters plastic Containers ? (plastic drums) and , does that amount of peppers (mash) Will call for extra care or precautions? Virgilio, I have never fermented a batch that large. As long as you follow proper safety protocols and everything is properly cleaned and covered, I’m sure you’d be fine. You might look into how commercial operations operate. When I’m fermenting, I’m using 5 kilos of peppers, which is yielding me 6 Liters when processed, during the initial fermentation, I’m getting expansion to almost twice that amount, which is making it difficult to find a proper container to not have too much headspace once it has “calmed down”. Any suggestions? Brac, are you using jars with airlocks? The gas is causing the expansion, I would suspect, but should be able to be released through your airlock or through burping the gases. You may need to use larger containers. Awesome site guys, can’t believe it took me this long to find it! Can I use distilled water for the brine? We don’t have specific ‘chlorine free’ water in South Africa. Thanks, Jacques. Yes, you can use distilled water for vegetable ferments. Let me know how it turns out for you. Yes, distilled works. Some people will use tap water and leave it out 24 hours on your countertop because chlorine is unstable (so I’ve heard). Love the site and all the information. A few weeks ago I made a Ghost sauce and it turned out great. I am about to venture into fermenting two different peppers I grew this year. Aji Amarillos and Ghosts. For the Ajis I am thinking that I will just make the pepper mash without water. I do not want to dilute their beautiful flavor. Am I right in my thinking that the water brine method would dilute the flavor or, actually give me more flavorful liquid increasing my final yield? Needless to say the more yield I can get with degrading it the better. Also, for the mash method, 1 teaspoon of salt to a pound of peppers does not sound like much salt, using canning salt. Any comments or suggestions? I know I am overthinking this but is my third year with the Ajis and they are my pride and joy. I am also growing them in the Chicago region. For the Ghost Peppers I plan to use the water brine method given that they are thin walled. I am planning to add some garlic to both but I still have some time to think about it since the peppers are still ripening. I got a late start getting the plants started this year. Thanks for this website. Hey, Ed. I don’t think the brine method affects flavor, really, so both methods are good from my perspective. As for the salt, it may sound like a lot, but that briny environment is important to stop the growth of bad bacteria. You still have pepper ripening? I’m also in the Chicago area and had to pick my peppers quite a while back. Let me know how it all turns out for you. Please follow up with a quick report. I and my readers would love to hear! Hey Mike. The deed is done. Processed about 1.2 pounds of Aji’s . They filled the quart jar about 2/3rds. Added the brine and weight and will just wait. I didn’t like the idea of any floating mash around the edges of the weight so I took some whole Ajis and and sliced them open and pressed them on top of the mash before adding the weight it worked great. Also did about 11 ounces of Ghost. We battled frost taking the plants in at night and covering others as long as we could. We finally lost the battle about 1.5 weeks ago, picked everything and did the banana in the bag with the peppers trick to help the ripening process. We still have about a pound or more the Ajis that are partially ripe so I will see if they continue to ripen. I will dehydrate them and use the flakes. I also have 1 Rocoto plant that I took inside. It has three peppers that I am hoping make it to adulthood. I did not get good germination with my Rocotos this year and the few pants that did survive never pollinated. Needless to say I might be buying seeds again. Oh, it reminds me. I think rocotos cross pollinate very easy. Last year I had two plants that the ripe peppers turned orange like the Ajis and were not as hot as they should be.f The seeds from them never did germinate. Sorry for running on. I will try to report on the fermentation and sauce around the new year. Can I use kombucha to give chill is a kick start? Jan, yes, you can use kombucha or brine from a previous ferment to get you going. Let me know how it goes. I had a small mental lapse and used tap water instead of my non-chlorinated water when I made my mash. Do you have any advice moving forward to save the sauce? Can I make a non fermented sauce out of it? I’m guessing it won’t ferment because of the chlorine. It’s my year’s end batch so I’m trying to save it if possible. As always, thank you for all the help. Brandon, if fermentation doesn’t start, you should still be able to use the batch. Just check it for any weird contamination. I would process the peppers with a normal recipe and cook it down, etc. Let me know how it turns out for you. I just mashed some ghost peppers and naga Dorset peppers. I added the sal water brine, but added a bit too much. I’m in a conundrum now. I want to drain it a bit so that the water just covers it, but I don’t want to waste any of the capsainoids. What to do? Mario, you can leave it as it, or add more peppers to use the brine. If you really feel you need to drain, best to do it sooner rather than later. Let me know how it goes. I wish that you would give us a percentage of salt by weight. For example, when I make sauerkraut I have learned to weigh the ingredients that are going into the crock and multiply by .02 (2 percent) to see how much salt I need. Then I weight out that much salt. To give a volume, by tablespoon, is not accurate. Different salts have different size crystals and therefore different volumes. But I get confused when I’m adding something like water (no water goes into sauerkraut since the liquid from the mashed cabbage is enough). I guess I’m going to make the mash of chiles, add enough spring water to cover and then figure out how much it all weighs subtracting the weight of the jar of course and then multiply by 2%. Any advice would be greatly appreciated. John, I see different percentages from different resources. I shoot for between 3-5%, as peppers are a bit more prone to mold that other vegetables. Some people go with 1.5%, while others will go up to 10% for mash. I feel about 5% is fine, but you can go even lower if you’re concerned about the amount of salt. Higher concentrations of salt will result in a slower ferment, but too low and you run the risk of letting the bad bacteria a foothold. Hey, hoping to have some help. I did this and it’s been about 7 days. The peppers are not changing color, but they definitely smell like thai chilies. I have noticed some black spots on a couple of the peppers, but didn’t know if they were there prior. Should I be worried. I filled a quart jar 2/3 full and put 3.5 tablespoons of salt and filled with enough water to cover the peppers. Any help would be appreciated. Thanks! Rhea, I’m not sure if those dark spots are rot, but it’s not a good sign. It would be rot from before you started, which could permeate the brine. Yuck. You may want to remove those and check them. Firstly, I love this website. Good work! Last weekend I harvested my chillis, made 3 of your sauces and decided to make a mash of everything that was left (Trinidad scorpion, naga, Orange habs and some prairie fire). I used the wet brine method. My mash has risen to the top. Do you think I should just stir this all up again and try to push the mash down (I don’t have any weights or anything involved)? Would I need to sterilise anything I use to stir/push? Should I add more fresh brine to ensure they are well submerged (although I’m sure it will just rise to the new level!)? Matt, yes, you can sterilize a spoon and just sort of shove everything down. It’s important that it stays below the brine to stay protected. You can always add in a bit more of the brine to make sure it’s all covered. Let me know how it turns out for you. love the site and already made the ghost pepper pineapple mango hot sauce. it came out great and made some for friends and family who also enjoyed it. I am trying to ferment a small batch of a 3 pepper blend of Ghost peppers, Thai Hot Chili and Cayenne for the first time. I have added small amounts of peppers to the mash since I first started it. I can clearly see the fermentation happening but not sure what type of funky smell I should be expecting. Kevin, you might not get a funky smell. Sometimes it’s a bit sour/acidic as it ferments, though if you get kham yeast growth, you might notice that grows extra sour, though you can skim it off the top. Let me know how it turns out for you. Thanks a lot, Kevin! I’m glad to be helpful. Thanks for spreading the word! ever be taken out and re-fermented ? Candyce, you can still make a paste from the fermented peppers, though be sure to drain them or you’ll get more of a sauce. You can add dried pineapples into the mix. They’re dried, so still should be safe and should last quite a while in the fridge, covered. The past won’t be in the brine environment, so I’m not sure how long, but still should have several months, covered. Just keep an eye on it. I’ve never tried to start a new ferment after refrigeration, but if you did try, you might need a culture starter to start it going again. Let me know how it goes if you try it. not actually go through the fermentation process? Thanks. Candyce, as long as the overall mix has an acidity of 4.0 or below, you should be totally fine if your goal is to keep it longer. I think it sounds like a wonderful mix. Have fermented yellow Devils Tongue chilli’s for 4 weeks, temperature in the Dry Tropics of Australia has been between 15 and 30c. All smells great. At the end of the article dated 20 sep 2017 you mention adding vinegar. How much vinegar do you recommend per pound of mash? Thanks, Joel. I would probably use up to a half cup of vinegar, depending on whether or not you’re using other ingredients, but would probably start with a couple tablespoons first and adjust for taste from there. Let me know how it comes out for you. Okay. First time trying the mash. I’m using hatch chilies because I wanted a green. Couple of questions. I seem to still have a lot of foam from the peppers in the food processor. Two. The brine is forming at the bottom of the jar. So I drained the jar and put the brine over top, used a storage bag to push the mash down again and poured the rest of the brine in the bag for weight. Think this will work? Christal, the foam is probably from air and the vigorous processing of the peppers. That usually subsides. Yes, it is necessary to keep the peppers below the brine. The brine in the bag should work perfectly. Very smart! I use a small glass weight to keep mine down. Let me know how it turns out for you. Hi! I followed these instructions and about 14 hours later, no brine has come to the top. I am using about 14 oz of jalapenos with just under a tsp of salt. Should I just make my own brine? Add more salt? As a side note, I read another site that said one should not do this with green hot peppers, but gave no reason why. Any thoughts on that? Lizzie, if you are concerned, it is probably best for you to use the wet brine method. You can use the peppers you are already using. Let me know how it goes. I have done both methods with green hot peppers without issue. It could just be a low moisture content of the peppers you are using. I made some brine (couldn’t get to it until about 48 hours later). It looked like there was some white stuff on the top of the non-brined peppers. Perhaps the start of fermentation? I did not scoop this out, but did attempt to pour in the brine. Even though everything was packed down, some pepper bits rose to the top. Maybe they’re processed too finely? Anyway, I then drained this in a strainer, and repacked the peppers. I managed to slowly put in the brine a spoon at a time. It’s a bit better, but still quite a bit footing at the top. Should I have scooped out the white bits? Is this a lost cause? Lizzie, the white bits might have just been kamh yeast, which is normal. You can scoop it out. It’s somewhat bitter. The best way to judge if the ferment isn’t working or is spoiled at this point is to inspect it. How does it smell? Is it off putting? Smell rotten? Is there a gross taste to the brine? You will know when it is bad. Do you know of anything that I could buy in my local grocery store that would work as a fermentation culture? I froze a bunch of peppers from my garden over the last couple months and I put them into jars today to ferment. I don’t know if Amazon can get me a culture packet soon enough if it doesn’t start fermenting. How often do you need cultures when you have fermented frozen peppers? Thanks again for all the help. Brandon, not sure if your local store will have dried starter cultures or not. You can always try to strain yogurt or kefir and use the separated whey as a starter. I haven’t tried that yet, though. If you do so, let me know how it goes. Just be sure it is properly strained and separated from the solids. I believe it’s working and fermenting is underway. Thanks for the tip! Great, Brandon. I also have a post on how to make whey – Homemade Queso Blanco. I’ve used about a 1/4 cup of sauerkraut brine (not jarred, use bagged or home made) to jump start the fermentation in the past, but a starter culture usually isn’t necessary from what I’ve recently read. During the 1-2+ week fermenting process, can you top up the pepper mash with additional chilis? The Serrano plant keeps producing and I figured I’d throw them into the batch during maybe the first week. Trent, I don’t see any real issue with this other than two things – an increased risk in contamination when you open the lids and the different levels of ferment in the peppers. I don’t think either is a big deal, though. Just be sure to watch out for any signs of contamination above the water line and make sure the added peppers are properly submerged. Let me know how it goes. Mike, great site and recepies. I’ve been growing chilies for some time and now have ideas what to do with them. Ine question tho. I started the mash with 3 different types of chilies using brine. Good non-clorine water and sea salt. They fermented quickly (I live in a hot climate 80+) but all of them have pretty strong bitterness. Can’t kill it even with sugar or honey. Any ideas what went wrong? Thanks, Jack. I sometimes get some bitterness with my fermented pepper batches. I’ve seen a lot of discussion on it, whether it is from kahm yeast or from the starting peppers themselves, where the slight bitterness is amplified in the fermentation process. The best way to counter it is through the addition of other ingredients. You’ve tried sugar and honey, but try adding an acid like vinegar or lime juice, which can help balance it out. Certain roasted vegetables can help, too, like carrots or other flavors. Garlic is good. They can all help balance out the bitterness. Give the final sauce time to rest and let the flavors meld in the refrigerator. Let me know if this helps counterbalance that bitterness for you. I tried making this last night and had a bit of a problem. I live in a warm climate and overnight a lot of the liquid overflowed and it all seems a bit dry now. After stirring it up I was able to get some of the liquid from the bottom mixed in but again it seems a bit dry. What can I do to save this? Add more water? Thanks! Eliot, just make sure you have enough liquid in the jar to cover the peppers and you should be OK.
Phillip, yes, I have used rosemary and other herbs in making sauces and hot sauces, both fresh and fermented. It’s a great addition for certain sauces. Give it a try! I have been fermenting about a pound of Serrano’s and a pound of Habaneros for almost a month now. I have been burping them every day and have dad to skim off a little bit of white off the top a couple times. In the bottom of my jars there is some white around the circular groves of the bottom of the jar. Both jars have a sour smell. I have never done this before so I don’t know how it’s supposed to smell or taste. Do you think it’s still good? Eric, it sounds to me like the whitish color around the bottom grooves is a result of sediment, which is harmless. The sour smell is fairly common, and often described differently by fermenters. Finished ferments should smell acidic and pickly, which can smell a bit sour. As long as it doesn’t smell “bad”, like nasty rotting. Do you have thoughts on a mash of Caroliner Reapers? Any thoughts on how I avoid doing serious injury to myself? I normally ferment with Cayenne chilis as I love the flavors. This will be my first experience with the reapers. Greg, I’ve made many mashes with superhots, so you should be fine. The biggest thing is ventilation. Make sure you are a well ventilated room, or maybe do it outside if you can. The fumes can really get you. Also, wear gloves if you have sensitive skin. Peppers don’t bother me, but I do feel the Reaper. True heat! Let me know how it turns out for you. I want to try this but I keep reading that for frozen peppers I may require a starter. Can you tell me what a starter is or what you recommend? REPLY: Leigh, it’s a “fermentation culture starter”. Do a search on Amazon or Google to find products. I don’t have a specific recommendation, but have had success with some. — Mike from Chili Pepper Madness. Hi, thanks for the recipe. I grew A LOT of pepper last year and froze them. I’m following your recipe to ferment them but my pepper mash keeps on rising up and the liquid brine keeps on the bottom. I food processed all of my red peppers into a mush and made the liquid brine to top them off but it just ends up at the bottom and the peppers are constantly in the air. I decided with my greens and habeneros to just slice them and add the liquid brine and that worked way way better like pickling. Anyhow what can I do with my red pepper mush to keep it from floating, should I take out all the brine on the bottom and add the salt dry? REPLY: Cam, I use small glass weights to keep the mash under the brine, though you can use large cabbage leaves. Let me know if that works for you. — Mike from Chili Pepper Madness. I have a freezer full of various peppers and was wondering if I can still ferment them? REPLY: Susan, yes, you can ferment from frozen peppers, though you may need to use a starter culture to get things going. — Mike from Chili Pepper Madness. I’ve heard of cooking the hot sauce after fermentation and before bottling. Is this common? I imagine you could feel certain you are creating a more shelf-stable product. Would this affect the fermented hot sauce negatively in any way? REPLY: Chris, yes, this is common. People often use the ferment as only a part of the recipe, cook it down with other ingredients, then cool and bottle it. 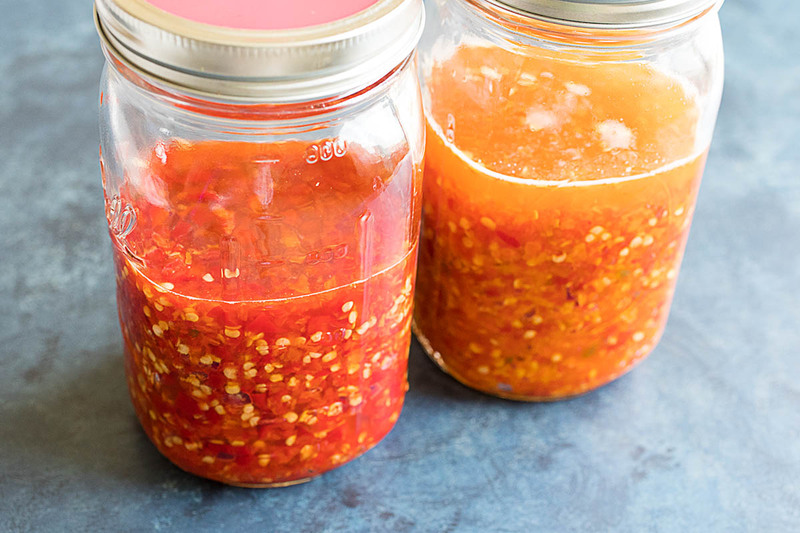 It’s a great way to make hot sauce. — Mike from Chili Pepper Madness. Hi just tried fermenting some chillies. I used a bowl with a porous cloth over the top, it’s been a week now and the mash has a white buildup on one side and smells rather like beer. I presume I have to put this batch down to experience and start again? REPLY: Charles, that is most likely kahm yeast, which is not harmful. You can just skim that off. It often happens when temps are a bit warm or when the salt content is low. No worries! — Mike from Chili Pepper Madness. REPLY: Hey, Andy. You can ferment mixed types of peppers without any issue. I do it all the time. Also, you CAN ferment frozen peppers, though you might need to use a culture starter to get the fermenting process going. — Mike from Chili Pepper Madness. Loving the recipes and tips. I am doing my first batch of fermenting with brine and 3 days in my liquid is at the bottom instead of the top…should I be worried? REPLY: Thanks, Imogene! Your peppers definitely need to stay submerged beneath the liquid. Push the peppers down beneath the brine, or use a glass weight or even a cabbage leaf to weigh the peppers down. — Mike from Chili Pepper Madness. I make hot sauce like the Tobasco Indians still do in the villages. Stem and wash the peppers, chop fine, pack into jars and put something in the jar to keep the peppers from floating. Cover with clean cloth to keep out the insects and curious hands. If fermented in the heat (80+ degrees), it needs no salt. When it’s done, use a sieve to strain out the sauce and keep the seeds and skins as pepper relish. If it’s too vinegary (the sugars in the peppers will convert to pepper vinegar) it can be cut with tomato juice. A variant of this is to ferment it in an airless environment so it never turns acidic. AKA Vino del Diablo. It should hit 6% alcohol if you’re into wine, and it’s great for cooking. Hi, I have mashed my chili’s and mixed in 1 teaspoon of kosher salt with pound ofchili as per your instructions and put in airtight jar, burped it everyday, but there is no brine forming and after week there is a lot of mould on chili’s. Must I throw away. What went wrong? REPLY: Jooste, if there is a lot of mold, you may need to toss and try the wet brine method. — Mike from Chili Pepper Madness. If using the 1tsp salt/lb method and making the brine with the pepper juices, what to do if there doesn’t seem to be enough liquid from the peppers themselves? Does it take a few days for all the liquid to rise to the top to cover them? After processing and adding the salt (to 4lbs jalapeno peppers), there isn’t enough juice coming out to keep the mash under the brine. Can I add water and adjust the salt at this point? (That is, the 1 quart water, then 1 & 3/4 tbsp salt, considering the 4 tsp already added). REPLY: Grace, I would add them to a properly salty brine solution to control the environment, yes. — Mike from Chili Pepper Madness. REPLY: Mark, they are fermentation starters – microorganism that help start the fermentation process. — Mike from Chili Pepper Madness. After 2 weeks I have a small amount of what I can only describe as cotton wool mould on the top of the fermented mash. Should I throw it away? REPLY: Paul, if there is that much growth on top of your ferment, sadly, I would toss it. A small film is normal, but not that much. Perhaps your peppers weren’t entirely under the brine? — Mike from Chili Pepper Madness. After about two weeks of fermenting, a white, crusty film forms on the top of the pepper mash. Is this an indication that the mash has gone bad? Should I scrape it off and use it anyway? I’ve kept the mash under brine for the entire time. What’s the story on the white crust? REPLY: Joe, usually that is a yeast growth called kahm yeast. Kahm yeast isn’t harmful, though it may have an odd smell. You should skim if off to avoid the smell affecting the peppers, though a little bit in the jar is OK. It isn’t harmful. — Mike from Chili Pepper Madness. Thanks for the great site! So… I processed about 1.5 lbs mixed peppers (3/4 misc.hot, 1/4 banana), mixed with salt, jarred and pushed out any air. Waited for liquid to rise. After a day, nothing had happened, still a solid mash. So I decided to add brine, thinking that would create the liquid needed at the top. 12 hrs later, and there is liquid, but it’s at the bottom! I’ve pushed the mash downward again, but still no liquid at the top. As long as it all stays moist, am I good to go? Thanks! REPLY: Cindy, yes, as long as the peppers are under the brine. — Mike from Chili Pepper Madness. A friend suggested making a fermented pepper mash. Can you do that with a single pepper? Phrased differently: Any suggestions for what to do witha single ghost pepper, to be able to show off its awesomeness? REPLY: DougT, I’ve never fermented a single pepper before, though you may be able to. If you want to make a sauce, I suggest pairing it with other peppers, like habaneros or even milder peppers. You’ll still get plenty of heat. — Mike from Chili Pepper Madness. Hello going to try my first take at fermenting peppers which are frozen. Do I need a starter culture and what should I use? Thank you. REPLY: Chris, if starting from frozen, you might need to use a starter culture, yes. — Mike from Chili Pepper Madness. whats the ratio for a proper salt brine ferment? i’m going to process different peppers in 50# batches. REPLY: Carolynn, use 3 tablespoons sea salt per 1 quart unchlorinated water. — Mike from Chili Pepper Madness. Hey I like to smoke my peppers first do you think this would affect fermentation.? REPLY: Gord, yes, you can ferment smoked peppers, but you may need to use a culture starter to get the process going, depending on your smoking method. — Mike from Chili Pepper Madness. REPLY: Lib, if you have a homemade brine, you should be able to use that to start your peppers. — Mike from Chili Pepper Madness. I ended up with only about a half of qt. jar of pepper mash . i added the brine , will that be a problem not having a full jar? REPLY: Dan, that will not be a problem. Just be sure to keep it properly sealed and use as needed. — Mike from Chili Pepper Madness. Can you ferment frozen peppers from a previous harvest? Ideally how long should I be letting them ferment? I have a setup with a quart mason jar and a lid with a water/air lock. REPLY: Bert, yes, you can ferment frozen peppers, though you may need to use a starter culture to kick start the process once they are thawed. Let me know how it turns out. — Mike from Chili Pepper Madness. I’d like to make a banana and chilli sauce/ketchup. Would I add the bananas at the fermentation stage? I’ve chosen Aji Amarillo chillies by the way. REPLY: Martin, I would add the bananas with the ajis, though I’ve never done this personally. Super curious how it turns out for you. Please let me know! — Mike from Chili Pepper Madness. Just discovered your site and I’m loving it! Quick question about salt: the quantity of salt would be different by volume if I were to use coarse, kosher or table salt. I rather not use sea salt. Is it possible to have the quantity of salt by weight? REPLY: Louis, I believe this is what you are looking for. — Mike from Chili Pepper Madness. How would you do this with dried peppers? If rehydrate first, howto do that? I’m eager to try thus but all my peppers are now dried. Thanks. REPLY: Harry, you can ferment peppers with dried pods. Depending on how they were dried, though, you may need to use a starter culture to get the process going. Rehydrating is simple with warm water. Just let them soak an hour or so until they rehydrate. — Mike from Chili Pepper Madness. Mike – you mention using dried peppers. I’ve got a slew of dried peppers that I further powdered from my harvest last year. Would that work for fermenting? I want to try your Louisiana Hot Sauce recipe. REPLY: John, you CAN ferment dried peppers, though depending on the drying process, you may need to use a starter culture to get the process started. — Mike from Chili Pepper Madness. I’m waiting for your tabasco-like sauce recipe, step-by-step and the chili pepper types recommendations. I’m sure it would be delicious! REPLY: Michael, coming soon, actually! — Mike from Chili Pepper Madness. A handful of years ago, I was given a moderately-sized fermentation pot (7.5 Liters.) I have successfully fermented chile peppers and garlic for the past three years. Fermented chiles are amazing and give a much deeper, rounder flavor. Seems to kick up the heat factor, too. I’m happy to see more information being published regarding chile fermentation–it wasn’t so easy to find info a few years back!